Featured Cruises - Fugazi Travel Agency Inc.
Silversea’s small luxury ships are designed for those who delight in the thrill of discovery while indulging mind and body in the most lavish surroundings imaginable. All accommodations are spacious, ocean-view suites that include butler service, and most include private verandas. Silversea voyages and cruise expeditions sail to over 800 destinations on all seven continents, more than any other cruise line. Our intimate, ultra-luxury ships can sail up narrow waterways into the heart of a city, or tie up right at the pier while others must anchor off shore. "World's Best River Cruise Line"
Our sixth Super Ship, S.S. Bon Voyage, just embarked on her maiden voyage, and we couldn't be more excited to welcome her to the rivers of Bordeaux. Her impeccable design truly reflects her French heritage, with stunning polished wood, subtle brass details, stylish emerald and blue fabrics, and fresh sunflowers and lavender throughout. Book one of our June – October, 2019 cruises along Norway's stunning coastline, and you'll receive up to $400 per person in onboard credit! Regardless of which cruise you choose, we're offering onboard credit for each guest, perfect for participating in a number of exciting excursions. Think: hiking amongst magnificent fjords, kayaking throughout charming Nordic towns, and even snowmobiling under the polar night sky! Book any of these activities on board, purchase items in the onboard store, or even relax with a glass of wine at the end of the day, all with your onboard credit. riverside pathways and extraordinary architecture. 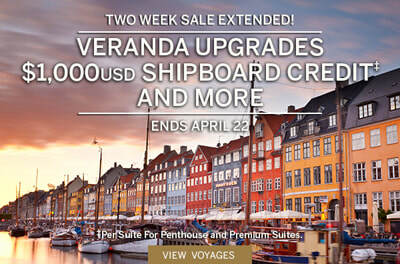 Book by April 22, 2019 and enjoy special pricing on select voyages*, Veranda Suite Upgrades*, $1,000USD Shipboard Credit for Penthouse & Premium Suites*, up to 15% savings on Combination Cruises*, and $500 Deposits to reserve your booking*. *On select voyages. See Terms and Conditions for details. Explore in greater luxury with a 2- or 3-Category Suite Upgrade on select voyages across Asia, Australia, New Zealand and the South Pacific — plus an additional $250 Shipboard Credit per suite. Embark on an unforgettable journey when you take advantage of this incredible offer with every luxury included and enjoy an unrivaled experience. 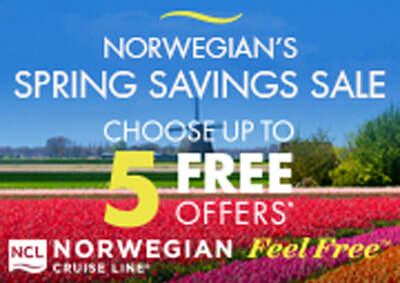 Norwegian’s Free at Sea promotion now lets you choose up to 5 fantastic, FREE offers! Book a Studio or Inside stateroom and choose 1 free offer or choose 2 free offers when you book an Oceanview, Balcony or Mini-Suite. Best of all, cruise in Norwegian’s Concierge accommodations, a Suite or The Haven and enjoy all five free offers. Choose from a FREE beverage package, FREE shore excursion credits, FREE specialty dining, FREE WiFi and Friends & Family Sail FREE. Better yet, on select cruises beginning Fall 2019, Free or Reduced Airfare may also be an added perk. Call your travel professional at 800-544-8728. 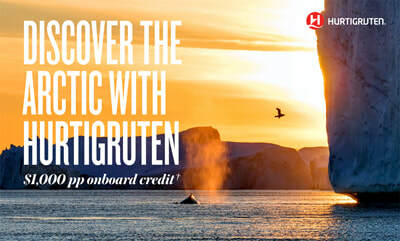 Connect with your inner explorer on an expedition cruise with Hurtigruten. Sail to uninhabited Franz Josef Land to search for polar bears; discover Iceland’s volcanoes and Greenland’s spectacular wilderness; or look for whales and walrus in the Arctic waters. 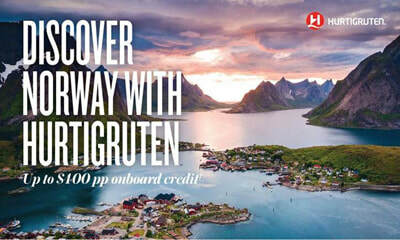 Book by May 31, 2019, and receive 9,000 Norwegian Kroner onboard credit (approx. $1,000) per person†. Save up to $6,000 per stateroom on A&K’s Classic Antarctica and $8,000 per stateroom on Antarctica, South Georgia and the Falkland Islands. Then, let our award-winning Expedition Team welcome you aboard luxury, all-balcony ‘Le Lyrial’ for the adventure of a lifetime. Now is the perfect time to start planning your 2019 vacation. For a limited time, Save Up to $2,000 per stateroom, PLUS, $200 Bonus Wave Savings or receive Free Airfare on some of our most exciting itineraries! Pack a little extra wonder and excitement when you cruise with us – as the third and fourth guest (17 years or under) in your stateroom sail FREE on select voyages. Our journeys to Alaska call out to your adventurous spirit, connecting you with the incredible nature of these wide open spaces. Share these awe-inspiring adventures and glacier views with family. Limited time offer, capacity controlled. Experience everything from the magnificence of Milan to the vivacity of Venice on our Gems of Northern Italy itinerary. Follow the most breathtaking stretches of the Main, Rhine and Danube rivers through The Netherlands, Germany and Austria on our new 2019 itinerary Alluring Amsterdam & Vienna, now available for a limited time with your choice of incredible savings. Touring is a wonderful way to see and experience the world and in 2019 we invite you to experience all the reasons you love touring on a river cruise. 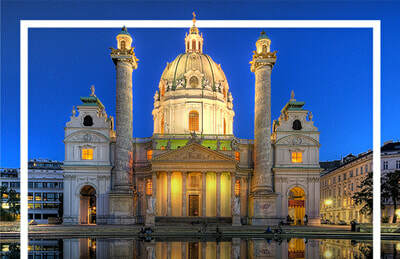 Avalon Waterways is a sister company to Globus offering river cruises in Europe, Asia and South America. This offer you know and love has been extended for a limited time, with new savings applied to over 80 additional dates! 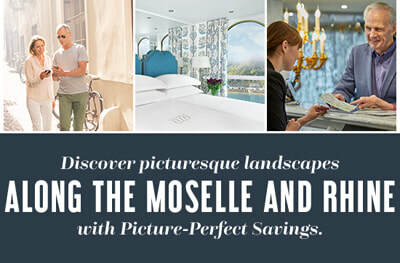 Don't miss your chance to SAVE UP TO 30% ​on select 2019 itineraries with Our Best Offer. Explore World Heritage-listed sites, hear from National Geographic experts and photographers, and enjoy insights during visits to special exhibits and locations only available on these sailings, all while enjoying Scenic’s all-inclusive river cruise experience. 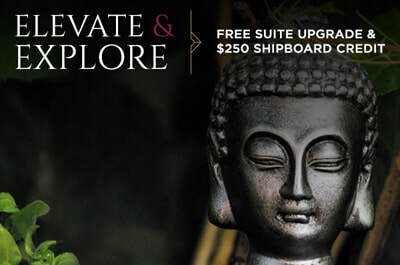 Contact your Travel Professional at (800) 544-8728 to book your suite today and enjoy the ultimate National Geographic River Cruise experience! The more our guests travel the world, the more fascinated they become by the many different people, cultures and places they explore. This continues to drive us to expand our vast collection of shore excursions to continually bring you the best life has to offer. From the arts and entertainment to natural wonders and historical sites, our guests now have even more opportunity to experience each destination in powerful and authentic ways. Wine with dinner, umbrella drinks poolside, evening cocktails, morning mimosas. With Free Unlimited Open Bar, Guests 1 & 2 enjoy all the spirits and cocktails, wines, draft beer, and juice and soda they want. Choose from up to 22 bars and lounges. You save up to $1,250. If you haven’t seen one Tahitian island, let alone six, now is your perfect opportunity aboard a boutique sailing ship. Depart from Los Angeles (LAX) and set foot in Tahiti in only eight hours. Then, step aboard Wind Spirit, an intimate ship that takes you to the most serene destinations in Tahiti. Experience hidden harbors, crystal-clear coves, and pristine white sands massaging your every step. The islands of French Polynesia invite you to discover their own distinct magic. Yachting in the Mediterranean is an experience one should certainly add to their bucket list. It’s known to be extra special from April through October when the days are longer and the nights seemingly more intimate. With extended sunshine comes longer strolls along the bustling sidewalks filled with unique cafes, and people. If you prefer floating over strolling, enjoy the longer days from the yacht's marina and indulge in the many inclusive water toys available aboard SeaDream. From the Algarve to the Aegean, SeaDream visits the most colorful and historical ports of the region. There's never been a better time to book a cruise than now with Norwegian's Free Airfare promotion. Start planning your next vacation with 200+ cruises to incredible destinations, including Alaska, Bahamas & Florida, Bermuda, Canada & New England, Caribbean, Mexican Riviera and Panama Canal. Plus, choose up to 5 Free Offers and we'll throw in Free Unlimited WiFi. The Galápagos Islands are some of the world’s most famous and beguiling islands, and now you can enjoy the Galapagos Experience with our offer for Free Roundtrip Economy Class Air on all voyages. Each moment of our 7-day cruises reminds you why this archipelago is such a special place. Here you can harken back to Darwin’s days, as you see the remarkable wildlife that once inspired him. From pelicans to penguins, green sea turtles to marine iguanas, sea lions to manta rays, these islands are the land that time forgot. 2020 Mediterranean voyage itineraries highlight the region’s most remarkable destinations as well as true hidden gems. The ultra-luxury mega-yachts will explore ports of call in the French and Italian Riviera, Greek isles, Spanish coast and Adriatic Sea. Offering a true yachting lifestyle and personalized service, the voyages include new ports of call and yacht land adventures as well as more overnight stays in select locations. Be among the first to experience Cuba in Seabourn style, on the most port-intensive, culturally immersive voyages to the most intriguing island in the Caribbean. We visit five fascinating Cuban ports, calling at three or four on each itinerary, giving you a diverse experience. We’ll linger overnight in its most enchanting, colonial UNESCO World Heritage cities, inviting you to savor all the history, humanity and life-affirming artistry of Cuba’s culture and its people. Let the good times roll on Norwegian Breakaway, the largest and newest ship to sail from the Crescent City. Get jazzed over her 26 dining options, amazing Broadway shows, open-air restaurants, bars and lounges, and breathtaking views along The Waterfront. What's more, she's the only cruise ship from New Orleans stopping at Harvest Caye, The Caribbean’s premier resort-style destination. Book your 7-, 10- or 11-day Western Caribbean cruise - and take it easy from the Big Easy. SeaDream’s award-winning 5-star service is second to none. From the moment you are welcomed aboard by the Captain, it feels as if you are being welcomed onto your own private luxury yacht. With a maximum of 112 guests and an award-winning crew of 95, the crew to guest ratio provides each guest with SeaDream’s incomparable style and expert attention to detail. Finish off summer in the Mediterranean in casual luxury. Enjoy cruising to or from San Francisco with Holland America Line in the comforts of our well-appointed, mid-sized ships. Encounter fascinating lands and cultures. Revel in spacious rooms, breathe in expansive views and relax in easy elegance. Holland America Line welcomes you aboard to discover timeless cruising, refined for a new generation. Call Fugazi Travel at 800-544-8728 to reserve your space! Welcome to a Europe few people ever see. ​Select a one-on-one excursion to a cooking challenge at a Maltese farmhouse, a photo safari in Croatia, or a chance to make your own Greek vase in Rhodes. Stroll palm-lined promenades and go windsurfing in cerulean waters worthy of all the praise. Dive deep into the culture with local onboard performers and onboard experts on oceanography, history, foreign policy, and more. Anchor in exclusive Monte Carlo, stunning Xlendi Bay on Gozo, and the hidden harbor of Monemvasia. Every Mediterranean itinerary is carefully designed to delight your senses and ignite your imagination. The river cruises you have been waiting for are here – and as a valued traveler, you’re among the first to see all the details. You can choose your cruise today, then explore the sights your way with virtually everything included for exceptional value! Along with exclusive visits and insider access to must-see places, Tauck includes a choice of guided shore excursions on every cruise so you can experience what matters to you most, without missing the sites you've longed to see. Welcome to new, immersive experiences. From bird’s-eye-views of a rainforest to drift snorkeling in coral gardens, Windstar’s voyages to Costa Rica and Tahiti offer unforgettable moments in paradise. Hike through renowned Manuel Antonio National Park to spot endangered white-faced capuchin monkeys and hundreds of tropical bird species. Enjoy a daylight transit of the massive Panama Canal, appreciating the incredible scale of the soaring walls dwarfing your small ship. Personally select and harvest your own black pearl in Raiatea for a memory that you will treasure forever. Every itinerary is carefully designed to bring you home with stories of unexpected discoveries. SeaDream’s Wine Voyages are designed to enhance both your culinary and yachting experience. Meet the personalities behind some of the world’s most renowned wineries, as well as several less familiar but equally notable vineyards and explore their flavors and history. The intimate River Royale captures the spirit and beauty of southwest France—your gateway to one of the most acclaimed wine regions in the world. She impresses with a design scheme reminiscent of Bordeaux, but it's her timeless elegance that takes center stage. With original artwork from Henri Matisse, French-inspired public spaces and staterooms, and the lovely Salon Gascogne's Aquitaine Bar, it's no wonder she captures the heart of everyone who steps onboard. Join her on our Bordeaux, Vineyard & Châteaux itinerary as she cruises through France's most captivating landscapes. Paul Gauguin Cruises is proud to be the winner of many prestigious awards in the travel industry. As the specialists to this idyllic region, we strive to reveal the ancient traditions, breathtaking scenic beauty, easygoing spirit, and warm hospitality of French Polynesia as no one else can. Designed specifically to sail these turquoise waters, The Gauguin also brings on board the Polynesian culture and joie de vivre that only the experts to the region can share. We offer voyages throughout Tahiti, French Polynesia and the South Pacific ranging from seven to 14 nights. Sail from the City by the Bay to destinations both near and far. Head west to Hawaii, north to Alaska, south to Mexico or sample other California cities along the coast. Whichever cruise destination entices you the most, you'll experience it aboard a spectacular Princess® Cruise.